Most of us use them, but how many of us really know that much about them? They are key in keeping our yards and gardens vigorous and healthy. I?ll explain the different types of fertilizers, chemical vs. organic and how they should be used. Don?t be misled by glitzy ads; here are the facts on fertilizers. All plants need three essential elements in order to survive. These are nitrogen, phosphorus and potassium; most often referred to as N-P-K. All of these elements are available in the soil and or the air, so why do we need fertilizers? Not all plants have access to all of the major elements--most often due to the type of soil they are growing in. The soil is affected by such factors as compaction and excessive farming as to the amount of nutrients that are available to plants. The three major nutrients each play a role in contributing to plants' health. Nitrogen helps plants make the proteins they need to produce new tissues. If too much nitrogen is available, the plant may grow abundant foliage but not produce fruit or flowers. Growth may actually be stunted because the plant isn't absorbing enough of the other elements it needs. Phosphorous aids in root development and increases flowering ability and bloom size. The fertilizer industry smartly markets high phosphorus fertilizer as "Bloom Booster." 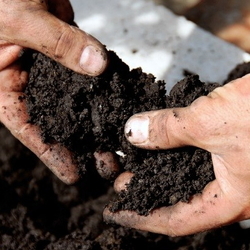 High-phosphorous fertilizer should be used when plants are being established in your garden. Potassium has many functions: It guards the plant against diseases and aids in drought protection and cold tolerance. It also serves a role in improving root development and helps in the process of photosynthesis. You might consider using a high-potassium fertilizer at the start of winter and summer to protect crops from temperature extremes or when insects and disease have caused damage to your plants. Most good fertilizers should contain trace minerals which are important to a plants vigor and health. Check the label for these ingredients. Many companies market specific fertilizers for specific plants; Rose Food or vegetable fertilizers etc. Check the N-P-K of these; many similar fertilizers have the same ratios at a much lower price. 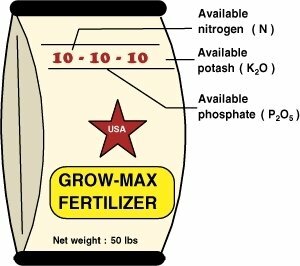 A tomato fertilizer may say 5-10-10 while a less expensive 6-12-12 will provide almost the same nutrients. A fertilizer labeled as a 20-20-20 has 20 percent Nitrogen, 20 percent Phosphorous, and 20 percent Potassium. I know many of you are thinking that's only 60 percent. The other 40 percent is made of micronutrients and fillers. There are three types of fertilizers available to the home gardener. granular, water-soluble and time-release. Granular fertilizer delivers nutrients to the roots slowly and lasts for a substantial amount of time. These fertilizers need moisture in order to break down and become available to the plant. Water-solubles are available much quicker but migrate through the soil very quickly. 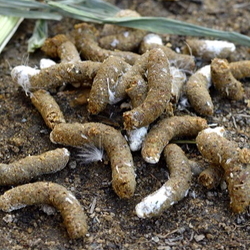 Time-release pellets have an outer covering that breaks down over different periods of time and will release nutrients over an extended period of time. Avoid applying granular fertilizers on windy or rainy days and use caution keep granular fertilizer off plant leaves. Water in granular fertilizers thoroughly to prevent burning. Time release fertilizers are ideal for use in containers, most last for a period of 3 to 6 months. Why is there a difference in the NPK numbers on chemical vs. organic fertilizers? It is easy to become confused when the NPK numbers on a bag of organic fertilizer are smaller than on a bag of chemical fertilizer, when the organic product costs the same or more than the chemical product. To understand the difference, it is important to understand that plants use only as much food as they need for healthy growth. For the nutrients in chemical fertilizer to be available to plants, they must be soluble in water. 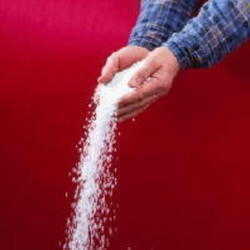 To be soluble in water, they must be in the form of salt. The problem with salt (chemical) fertilizers is that once dissolved in water, they are subject to evaporation, gasification and runoff, resulting in a significant percentage of their nutrients ending up in underground water tables, streams, lakes and oceans. The NPK numbers on chemical fertilizers are higher to offset the losses to runoff, evaporation and gasification; the NPK on organic fertilizers reflect the actual nutrient content of the ingredients. Most perennials, shrubs and trees should be fertilized in the spring. Vegetables and annuals should be fertilized at half-strength when planted and fertilized again several times throughout the growing season. Most lawns need to be fertilized several times throughout the season, depending in which area you live.